Landscaping Solutions are a professional landscaping and garden design company, providing first class services to clients across Surrey and Greater London. Good customer service, ethical working practices and an excellent eye for detail have led to us winning multiple Royal Horticultural Society and British Association of Landscape Industries awards. We have a particular emphasis on helping garden designers manage and realise their landscape gardening projects and are proud to work closely with a number of prominent members of the Society of Garden Designers. 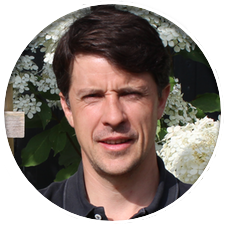 Ben West established Landscaping Solutions in 2005 following twelve years in the landscaping sector working at all levels from labourer to Managing Director both at home and overseas. Ben combines a keen interest and involvement in conservation, natural history, landscapes and the great outdoors with formal qualifications in Garden Design and Horticulture from Capel Manor College. Ben’s day to day role involves making sure that the company’s exacting standards are upheld and that staff and clients are happy and inspired. He lives in Molesey, Surrey with his wife and three children. We offer an extensive range of landscaping services from consultation and garden design through to all aspects of construction; brickwork, paving, joinery, water features, irrigation, lighting and so on, to planting and long-term garden maintenance. Across our entire range of landscape gardening services we work to the highest possible standards, resulting in a finished product and service we can all be proud of. We have an extensive company portfolio of completed landscape projects throughout Surrey and Greater London. Click the button below then use the arrows or swipe through to view a selection of our landscape gardening work. If you require further information regarding any of our professional landscaping services, please feel free to contact us using the contact details below. We look forward to hearing from you. © 2019 Landscaping Solutions LTD | Professional Landscaping & Garden Design Services | Surrey & Greater London | Web Design by JD.